April | 2010 | Eugene is huge! I am a fan of the comics. When I was a kid, every Sunday I’d get the newspaper and read the comic section to get my laugh on. Garfield, Calvin & Hobbes, Shoe, Wizard of ID, and Peanuts were some of my favorites. These comics usually were no more than 3 or 4 panels with a good one liner for the punch line. Sometimes they were hilarious, other times they got a tiny chuckle, but the jokes were at least understandable. Okay so what does this have to do with Korea? Well, I’m not here to talk about Korean comics, or manhwa (만화). I’m talking about two comics written in English that appear regularly in The Korea Herald, one of Korea’s two major English-language newspapers. (The other major English-language newspaper is The Korea Times.) The comics are Ssomi & Hobo, by Artier Lee, and ROKetship by Luke Martin. Sometimes they are funny, sometimes they are not. I appreciate that when you are trying to make a creative endeavor, often you run out of material and start scraping the bottom of the creative barrel, so while I will be critical of both of these comics, I mean no disrespect to their makers. Look at all the tourists! 4. Inside the attraction, are there places to spend money (aside from vending machines)? 5. (In Korea’s case only) is there Japanese signage? 6. (In Asia’s case) Do government sponsored pictures of the attraction proudly feature white people enjoying the attraction? 7. After visiting the place, do you feel that it wasn’t quite as good as what you anticipated? Why did I make this test? Because there is one tourist attraction in Seoul that answers “no” to all 7 of the questions. There is no reason whatsoever to believe that this place is a tourist trap, even though there are plenty of foreign tourists there taking pictures of their vertically arranged children RIGHT NOW!!!! What wonderful beautiful free of charge place is this that is that I speak of? 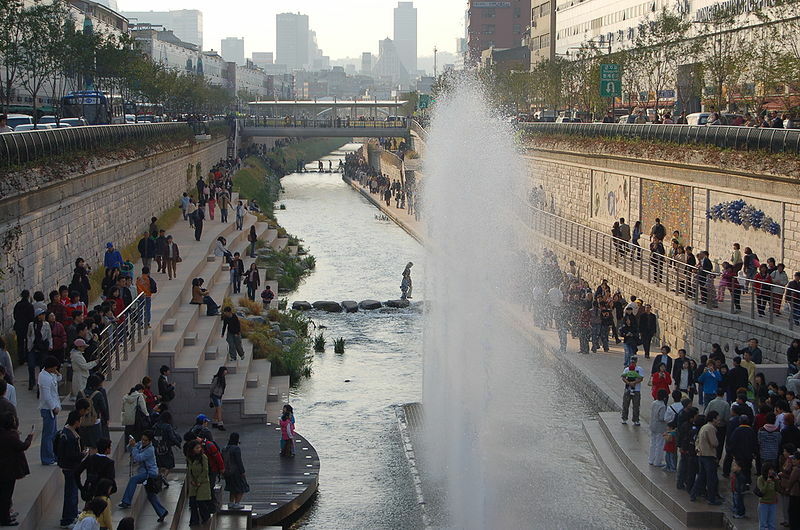 Why, it’s Cheongyecheon, of course. Dual Citizenship Allowed in Korea! The Korea Times has reported that a piece of legislation allowing dual citizenship has passed in the national assembly. 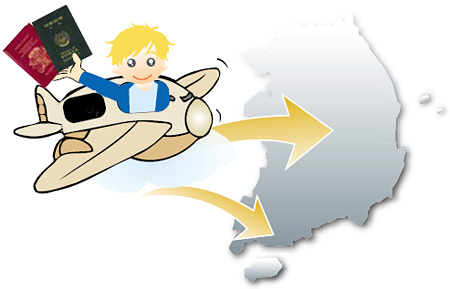 This means that it will be possible for citizens of other countries residing in Korea to naturalize as Koreans without having to renounce their other citizenship(s). This is quite amazing since in the past, even people who were dual citizens at the time of their birth had to choose a citizenship before 18. Not so anymore! Korea is definitely moving forward and recognizing the reality that in our globalized world, there needs to be flexibility in how we define citizenship and nationality. Furthermore, this encourages a shift in Korea towards a more multicultural society. Before, I had considered naturalizing, but never seriously, because I didn’t want to give up my U.S. citizenship. Now that I may not have to, It might actually be worth my while to acquire citizenship. I have not yet found any information as to when this law takes effect, but it is definitely a step in the right direction toward joining international society! Well basically Samsung Electronics makes lots of cell phones and digital cameras, and these days it’s popular to make them with some kind of detachable media, usually as a flash memory card. Basically, that means less loading times, less saving times, and you can get to your stored data that much faster. 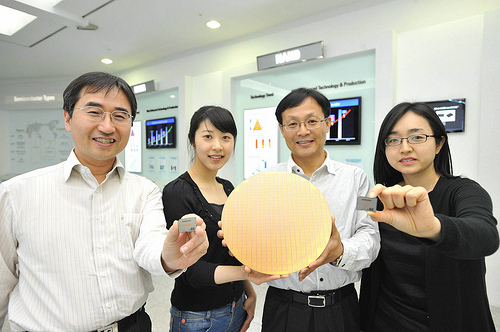 Hopefully we will see the benefits of this new NAND flash card in future Samsung products. I admit that I don’t know much about flash media, only that I don’t like to wait for stuff to load or save. If you are interested, click here to learn more! Korean DMB 2.0 service has begun! 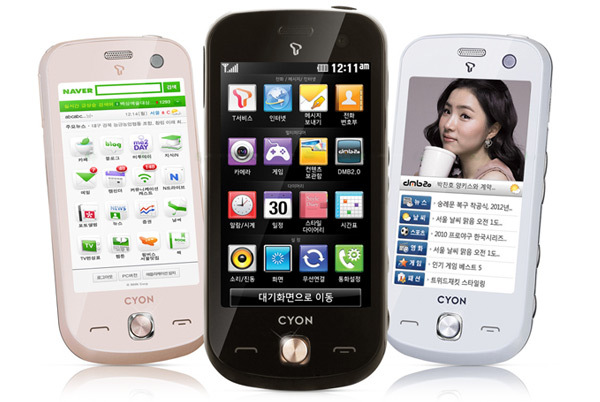 Man, I love me some advanced cellular phone technology, and Korea is leading the world with this stuff! I explained before what you could do with DMB 2.0, and the service has now started! LG has released the world’s first DMB 2.0 enabled phone! LG electronics has released the first DMB 2.0 enabled phone, the LG-SU420 nicknamed the cafe phone. Here’s a demonstration video showcasing all the features! It has a 3.2 inch touchscreen and 3.0 megapixel camera as well. This phone looks really cool! Well what do you know, I actually found myself in Gwangju with time to actually visit the light expo and it was really amazing! It was good in all the ways that it was supposed to be, and given that I happened to be there on a weekday afternoon, I was able to enjoy it without the busy crowd that might have been there in the evening or on a weekend. I’m sure it would have been better at night, but it was still quite entertaining in the daytime. 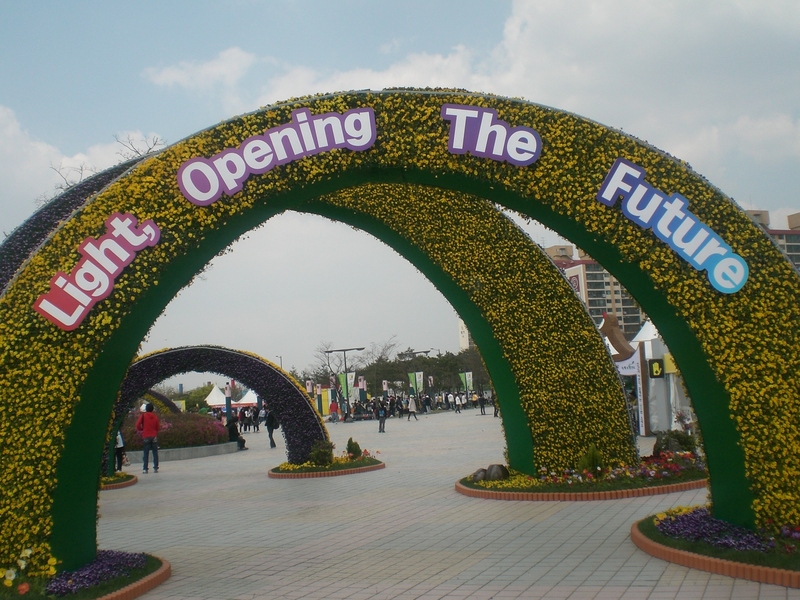 The expo was divided into several different pavilions, so I will explain about each pavilion in the order I visited them. More details after the jump! Be White? Why can't Yuna just be Korean? 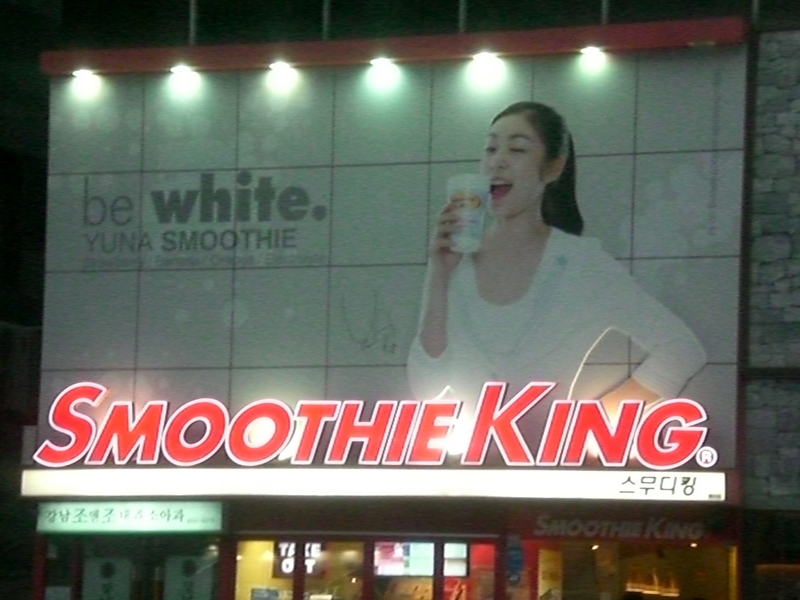 Smoothie King Korea is starting to use 2010 Vancouver Olympic Figure Skating Champion Yuna Kim in advertisements. They’ve developed the Yuna Smoothie, which according to the website says it contains bananas, strawberries, oranges, and Yuna powder. I wonder what Yuna powder could possibly be? I like Yuna Kim, and I know this advertisment isn’t telling Koreans to strive to be white people, but I can only imagine the laughter from my friends if this were shown in the U.S. I wonder what be white is supposed to mean then. I assume it has something to do with snow. After some research, I found a video about the TV commercial shows that the full campaign is called be white 2018, which means that it’s somehow tied in with Pyeongchang, Korea’s 2018 Winter Olympics bid.